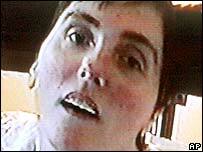 A US federal judge has refused to order doctors to resume feeding Terri Schiavo, the brain-damaged Florida woman whose fate has split her family. Her parents had failed to prove a "substantial likelihood of success" if the case went back to court, Judge James Whittemore ruled. President George W Bush has intervened to allow courts to review the case. Mrs Schiavo, 41, who has been in a vegetative state since 1990, has received no food or water since Friday. In his early-morning ruling in Tampa, Florida, Judge Whittemore wrote that Mrs Schiavo's "life and liberty interests" had been protected by Florida courts, the Associated Press news agency reports. Despite "these difficult and time strained circumstances", he wrote, "this court is constrained to apply the law to the issues before it". Lawyers representing Mrs Schiavo's parents, Bob and Mary Schindler, said they were likely to appeal against the decision. Mrs Schiavo's feeding tubes were removed at the request of her husband. He says she would not want to be kept alive artificially and has no hope for recovery. Doctors say she could survive several weeks without any food or fluid. Mrs Schiavo's parents have argued that she responds to them and could improve with treatment. Her brother, Bobby Schindler, said his family was crushed by Tuesday's ruling. "To have to see my parents go through this is absolutely barbaric," he told ABC's Good Morning America. But Howard Simon, director of the American Civil Liberties Union of Florida, praised the ruling. "What this judge did is protect the freedom of people to make their own end-of-life decisions without the intrusion of politicians," he said, the AP news agency reported.